I went to a party on New Years Eve night. And by party I mean six good friends shoveling food in our face and playing Cards Against Humanity for three hours. I wanted to take something simple but hearty to the party. Something substantial so I wouldn’t go hungry and something that would also be husband approved (i.e. man-friendly). 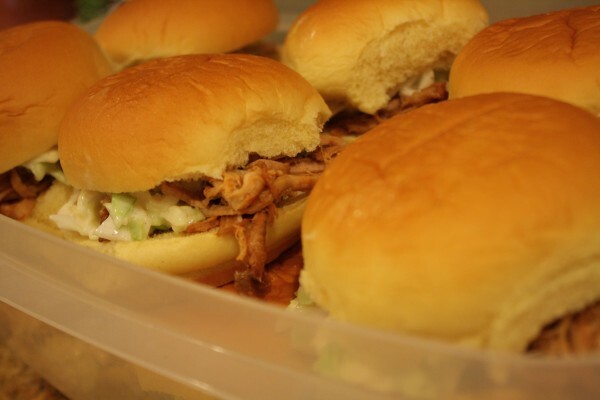 So I decided to make miniature versions of one of my favorite crockpot meals — crockpot pulled pork sandwiches, or in this case sliders. 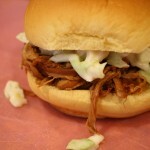 Down here in barbecue country, people often like to eat barbecue with barbecue slaw, which I for one have never liked. Slaw just shouldn’t be pink. 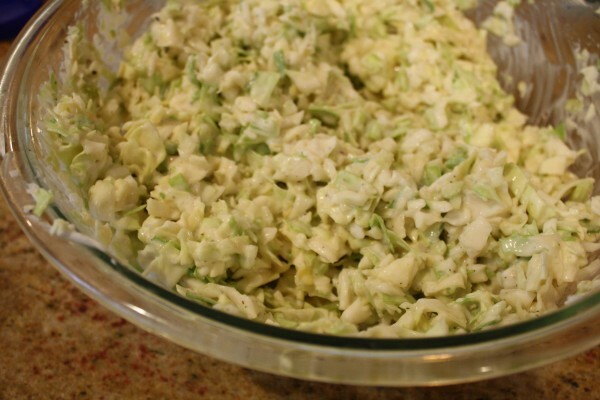 However, I do like good ol’ regular cole slaw, drenched in mayo with just a hint of sweetness. And since my friends at Chobani generously shipped me a crate of yogurt, I decided to incorporate some nonfat Greek yogurt, to lighten the slaw up just a bit. It turns out that pulled pork that practically cooks itself goes oh so well with creamy coleslaw and miniature potato buns. They were a big hit at the party and more than made up for the s’more bark I attempted to make which was a big fat flopping fail. It turns out milk chocolate cannot be melted to a consistency that can be poured. This is why I’m not a baker. This pork practically cooks itself. Chopping the cabbage is the hardest part and then the rest of this party food comes together lickety split. Place tenderloin in a crockpot and turn heat to low. Sprinkle evenly with garlic powder and pour 1 1/2 cups barbecue sauce over pork. Cook for at least eight hours. If short on time, turn heat to high and cook for at least four hours. When tenderloin is thoroughly cooked, place in a large bowl and use two forks to pull the pork apart until shredded into bite size pieces. 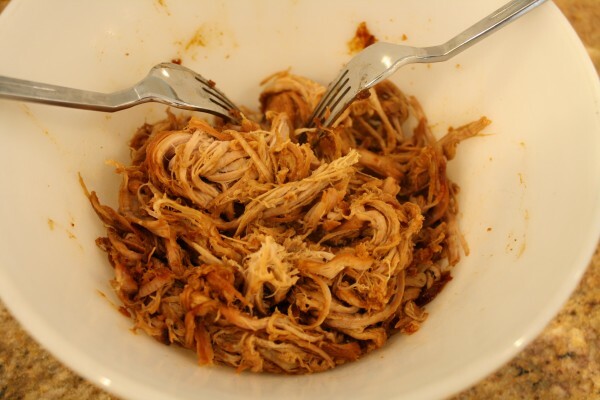 Pour remaining cup of barbecue sauce over the pork and toss to thoroughly combine. Combine all ingredients in a large bowl and stir well to combine. Open potato rolls and scoop a scant 1/4 cup of pork on the bottom half of the roll. 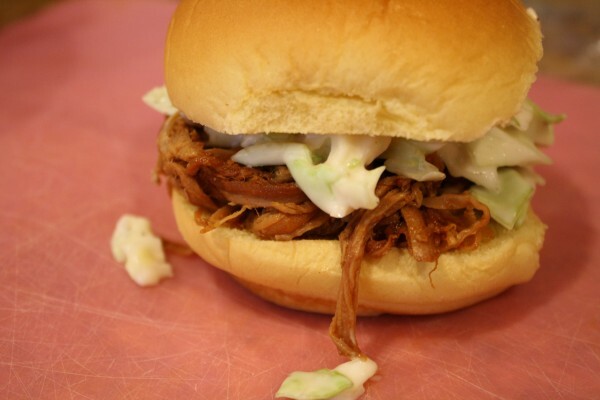 Top pork with a slightly smaller scoop of slaw and top slaw with the upper half of the potato roll. I used Chobani yogurt and my grandfather's homemade barbecue sauce. However, when I don't have my Papaw Leon's famous barbecue sauce in my fridge, Stubb's Barbecue Sauce is my go-to brand.